Welcome to our 2nd guitar lesson for beginner guitarist, where you will start learning how to hold guitar chords. This is the real starting point of making music on your guitar. 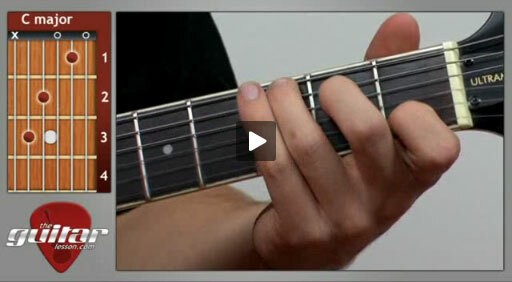 The basic chords you learn in this lesson will enable you to play hundreds, if not thousands of songs on your guitar. I'll teach you the basics of chords and the correct way of holding them, but it's up to you to practice them. Practice makes perfect, so practice these chords, and you'll see that they'll get easier and easier with each passing day. A common problem beginners have is that their fingers mute the adjacent strings, so they think their fingers are too fat for the guitar. This is not true, it's just a technique thing, read about it here. Sorry, but you've reached a premium content area. The download of the Guitar Chords – beginner guitar lesson #2 tablature file is only available to premium members. Sorry, the same goes for the backing track. To download the backing track to Guitar Chords – beginner guitar lesson #2, please log in and revisit this page. Thank you Tom, that helped. Is it okay to hold the neck of the guitar up a bit higher so it is at a different angle? If so then the chords become more manageable. 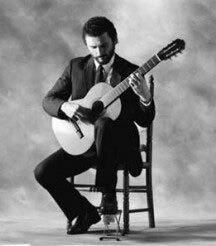 I had an elbow injury about 10 years ago that restricts my hand rotation movement so I cannot rotate my wrist perpendicular with the guitar neck when the neck is parallel with the ground. Glad it helped! It’s OK to do basically anything, as long as you get the desired effect, and it stays comfortable. This is a bit extreme for a normal guitar player, but it helps relieve a lot of wrist and elbow tension. I just wrote a detailed post on the topic of fat guitar fingers, have a look. I am having trouble with the C Major chord with muting the G strong because I have big fingers and hands and when I fret the B string on fret 1 it either also touches high string E or string G. I tried arching my fingers but I can’t seem to get it because my finger tip is to wide for the fret board. My finger tips have got harder as I have at this for several weeks but I still have the sane issue. A lot of new students have this problem, but I’m 95% sure it’s just the positioning of your finger. Without fretting the entire chord, can you place just that one finger on the string on the given fret without it touching the adjacent strings? If so, than you’re good to go, that finger position is what you’re aiming for. Also, you might have to turn your wrist outwards, so that your fingertip becomes more parallel with the guitar neck. i am having trouble with the notes ether side of where my finger is placed, wondering if you had any tips to help me overcome this problem, cheers. Hi, do you mean that your finger is touching the strings above and below the one you are holding? If so, make sure you arch your finger more, so your fingertip is basically perpendicular to the fretboard.